When it comes to job hunting, it’s natural to focus on what you should be doing. The flipside of the coin is avoiding those practices you shouldn’t be doing. 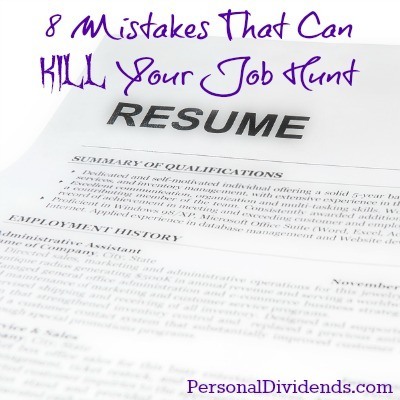 No matter what else you’re doing, there are at least eight mistakes that can kill your job hunt. Many job hunters overkill on their resume and cover letter, under the mistaken assumption that those documents will enable them to get hired. More realistically, your resume and cover letter are simply advertisements that should provide no more information than is necessary to get a perspective employer interested in your candidacy. If your resume or cover letter are much more than one or two pages, you run the risk that they will never be read. Reviewers appreciate brevity, and you need to master the art of saying what is important in as few words as possible. Job hunters often produce laundry lists of skills, qualifications, and experiences that might look impressive, but they don’t represent your core strengths as a potential employee. You need to identify these core strengths – those skills are the very reason why any one would hire you. Once you identify them, you have to learn to present them in the simplest and most effective manner possible. And you need to bring them out early and often in the process. Everything else is just meaningless filler. This is sometimes referred to as the “shotgun approach” to job hunting – you’re using volume to land a job. But put another way, it can also be referred to as throwing a lot of crap at the wall and hoping some of it sticks. You have something close to zero chance of landing such a position. It exaggerates the decline/non-response rate on your applications – i.e., “I sent out 100 resumes and didn’t hear from any of them.” That can be discouraging, but the failure rate is completely bogus – you aren’t qualified for any of the jobs. You waste time applying for jobs that could be better spent on more productive pastimes. If you’re currently employed, you risk tipping off your employer that you are looking for a job by blasting your resume all over the place. Unless you are unemployed and desperate, your job search should focus on job opportunities that are at least a reasonable fit for your skills and abilities. In this day and age of rampant cost-cutting, setting your salary requirements too high can be an instant disqualifier. Employers have a number in mind at which they will hire you; if your figure is substantially about this, your candidacy will end – unless you bring an unusual degree of specific talents to the job. Know what the salary range is for the specific job you’re applying for, and keep your requirements within that range. Job hunters often underestimate the importance of the job interview, preferring to rely on a good-looking resume. But as stated above, a resume just a door opener – a personal advertisement to get you an interview. What you do in the interview will likely determine whether or not you are hired, more so than anything else. One of the best ways to blow an interview is by not knowing anything about the company you’re interviewing with. The employer will assume that either you’re disinterested in the company, or that you are not a knowledgeable candidate. At a minimum, you should want to know as much about the company as possible so you can ask intelligent questions in the interview. Demonstrating knowledge about the company is one of the best ways to impress an employer. This is Job Hunting 101. It’s in virtually all of the how-to-get-a-job books and seminars, yet many job hunters fail to do it anyway. That’s virtually unforgivable, especially in an age of email. Don’t think of a follow-up letter, or thank you letter, as a mere formality. Instead, think of it as your last chance to make a good impression. The job interview went well… you hit it off well with the interviewer… you really like the company…you’re sure you got this job! Many job hunters come out of interviews so sure of their success, that they come home, relax, abandon the job hunt, and wait for the job offer to come in. Usually it doesn’t – notwithstanding the fact that everything went so well. It’s fine to feel good about an interview, and your candidacy for a job, but from a practical standpoint you need to continue the job hunt even after an apparently successful meeting with an employer. Job hunting is like sales – you have to contact a lot of people in order to find a few who will do business with you. Never assume you have the job – always be prepared to keep plugging no matter what. Avoid these job hunting mistakes, and you can increase your chances of finding a job substantially.